VINTAGE COSTUME ANTIQUE ESTATE JEWELRY BROOCHES AND PINS! Exquisite Juliana brooch in a geometrical stepped construction creating a lavish 3-D effect For Weddings, Proms, Pageants And Parties! 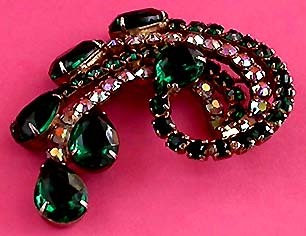 Item #P168228 - Juliana Emerald Green Aurora Borealis Crystal Rhinestone Goldtone Vintage Antique Estate Brooch Pin. Size: Length: 2 1/2" x Width: 2". Exquisite Juliana brooch in a geometric stepped construction creating a lavish 3-D effect! 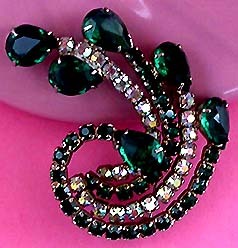 The sumptuous, elegant swirls encrusted with rich Emerald Green and sparkling Aurora Borealis round crystals are twirling artfully in graceful femininity! More... the voluptuous, flawless teardrops have the depth in clarity of the real jewels and shimmer lush flashes from every facet. Each teardrop measures almost 5/8" x 1/2" and are secured by four prongs in a goldtone openback finding (typical of Juliana jewels). 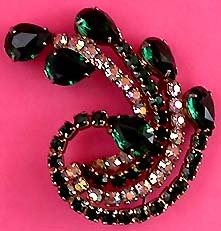 This tantalising Juliana brooch sings and dances its way into capturing a woman's heart! Excellent condition. A fabulous Vintage Antique Estate Brooch Pin to wear at weddings, prom nights, pageants, parties, cruises and special functions! Price US$148.00. SOLD.